Ridley Scott returning to the realms of science fiction is cause enough to celebrate. After the awesome one-two punch of Alien (1979) and Blade Runner (1982) he left the genre to make films such as White Squall and 1492 which, let’s face it, didn’t set the world on fire. I appreciate that there were some gems in there too, but it always seemed strange that the man behind two of the most influential science fiction films of the past 30 years has taken this long to return to the genre. And how! One has to admit that, if you’re going to make a science fiction film, naming it Prometheus suggests you have some pretty lofty aspirations. The Prometheus myth indeed being the most important single aspect of sci-fi, you get the feeling that Mr Scott wanted this to be THE best science fiction film ever made. Which, of course, it isn’t. Set towards the end of this century, the plot concerns an archaeological breakthrough indicating disparate primitive societies on Earth had a common object of worship, and that the said object had a hand in the creation of man. Several years later, a crew is sent into space to attempt to make contact. I’m attempting to be as vague as possible in an attempt to keep it fresh for you, dear reader, because one thing that Prometheus does just as well as the original Alien is fill one with the sense of discovery felt when the protagonists reach their destination. I rewatched the 1979 film the other day and it struck me once again just how perfectly constructed the scenes when the miners discover the downed spaceship are, with information being delivered to the audience bit by bit. It’s the same with Prometheus – I found myself wanting to look around the ‘corners’ of the screen to see what was around the next bend. There was a sense of wonder present that didn’t really occur during the Alien sequels (except maybe – believe it or not – in Alien Vs. Predator). Ridley absolutely nailed this aspect of the film. One thing that is completely different from the original is the epic nature of proceedings. There’s nothing subtle about Prometheus. The sets, the tone and the events are grandiose and awe inspiring. Some may find it wanky, but the fact remains that the tenor of the film certainly lives up to the title, even if the narrative does not. You see, the problem is that when you aim so high, just about anything will be disappointment. If everything were wrapped up in a neat little bundle, it would feel trite, and if questions were left dangling, it would be frustrating. So in some ways it feels like a doomed enterprise. That’s not to say that I didn’t like Prometheus. In fact, I loved it despite its flaws. The characters and performances are top notch. Noomi Rapace and Charlize Theron play perfectly realised heroines, each with their own agenda and manner of operating. Michael Fassbender has a hell of a lot of fun as an android that, like Ian Holm, Lance Henrikson and Winona Ryder before him, is just that teensy bit too human for comfort. Guy Pearce makes an appearance, but is mysteriously cast as an elderly man, which means we have to watch him wearing a tonne of awful aging prosthetics. Why they couldn’t simply cast an actual old man, we’ll never know. It seems that Ridley Scott’s aim with Prometheus was to make a film similar but different to his original, and in that he succeeds brilliantly. There are numerous thematic and visual references, but the film isn’t as overly concerned with leading into the 1979 feature in the same way that 2011’s The Thing was. Deliciously, Prometheus does however charge headlong into H.P. Lovecraft territory, something in which Alien only dabbled. The biggest flaw would have to be some of the dead ends in the screenplay. It smells just a little bit of the ‘too many rewrites’ problem that plagued the likes of Green Lantern and Indiana Jones and the Kingdom of the Crystal Skull. Unlike those two films, however, I have absolutely no quibbles about the visual effects. This is a film that has to be seen on the big screen – indeed, some shots look like they’ve been taken from an Imax documentary – and for the first time in ages I genuinely enjoyed the 3D on display, too. It’s strange to think that the only reason Scott was able to make this prequel to Alien, which doesn’t even feature the word ‘alien’ in it, is probably because the franchise was run into the ground with the likes of Aliens Vs. Predator: Requiem. 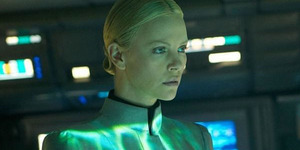 I, for one, am happy Prometheus exists, though some reactions online have already been quite negative. A couple have accused the film of being anti-science. To that I can only point out that, to a certain extent, one could argue all science fiction is anti-science (or at the very least, they are cautionary tales). After all, things didn’t turn out too well for Victor Frankenstein either, did they? Stuart spoke about Prometheus on Episode 45 of the Chatflix Podcast. This entry was posted in Film Reviews and tagged Horror, Science Fiction by Stuart Wilson. Bookmark the permalink. When it comes to science fiction movies, the best of the genre are thought-provoking and mature, asking profound questions on the state of man. 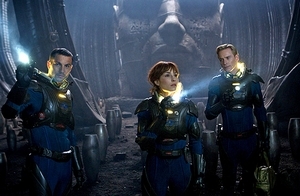 And, then there are films like Prometheus. When a team of scientists discovers a link between the ancient paintings of widely disparate early human civilisations, they imagine an invitation of sorts, an opportunity to reach out to another intelligent species and answer some of humanity’s most fundamental questions. Why are we here? Are there more like us? After setting off to meet their makers, they will find an unexpected threat that endangers us all. 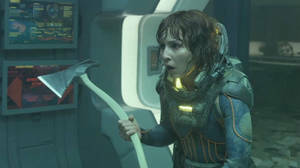 As a prequel to the Alien films, it is necessary to address the elephant in the room: Prometheus could readily pass itself off as any other generic science fiction / alien film, and is barely recognisable as a part of the quadrilogy. There are signposts scattered throughout that nod to Alien but, as a prequel to one of the most iconic and beloved science fiction series of all time, it carries an air of importance it never really earns. The ‘science’ part is often poorly researched and/or executed in science fiction films, but there are frequent moments in Prometheus that would be laughable if the production wasn’t clearly meant to be taken so seriously. The (over-)reliance on a mysterious and all-powerful goo is frustrating enough, but it seems to follow no biological rules as commonly understood. Anyone with even a high school understanding of biology or general science will be picking this film apart before they’ve finished their choc-top. Additionally, that the film’s writers (Jon Spaihts and Damon Lindelof) saw fit to pad out their cast of characters with fools beggars belief. This is supposed to be the most important research expedition in the history of humanity, with one character explaining that there were a trillion dollars spent on the trip, and some of their ‘scientists’ show such utter disregard for their work and safety that it simply cannot be believed they have earned their passage. Amazingly, Prometheus does manage to create an illusion of being scientific and meaningful, that might lull some viewers into accepting its illogical premise and enjoying it for its sparkle. And sparkle it does: this is one heck of a production, with astonishingly beautiful sets and backdrops that help to create a sense of wonder and awe befitting the lofty goals of its writers. 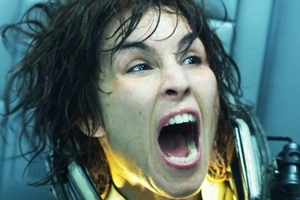 It is one of the smaller scale sequences that is the most effective, however, with Noomi Rapace pulling off a body horror piece with aplomb. While the performances are generally adequate, only Rapace and Michael Fassbender are given the benefit of playing characters that weren’t whittled by Geppetto. Stuart’s opinion notwithstanding, Charlize Theron is given so little to work with one wonders why they bothered hiring a ‘name’. Guy Pearce suffers a similar fate. 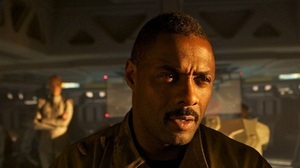 Idris Elba is the only performer who rises above their role. It goes without saying that there will be legions of fans of the Alien series that must be wondering why the hell Ridley Scott bothered to come back to this well after such a long time, for such a waste of an opportunity. Disappointing doesn’t cover it.